An active performer in a variety of genres, clarinetist Roman Fukshansky is highly in demand throughout the San Francisco Bay Area and abroad. Co-founder of Ensemble San Francisco along with pianist Christine McLeavey Payne, Roman serves as Principal Clarinetist with Berkeley Symphony and Symphony Napa Valley, and as Acting Principal Clarinet of Modesto Symphony Orchestra. Roman also performs regularly as a guest musician with the San Francisco Symphony, San Francisco Opera Orchestra, and as Principal Clarinetist with the San Francisco Academy Orchestra and the San Francisco Choral Society. He has previously served as Principal Clarinet with the Winston-Salem Symphony (NC), Augusta Symphony and Opera Orchestras (GA), the Claremont Ensemble of New York; as a member of the Midland-Odessa Symphony (TX) and the Philharmonic Orchestra of the Americas (NY), and as guest musician with the Charleston Symphony (SC). Roman has appeared as guest Principal Clarinetist with the San Francisco Symphony on numerous occasions, has recorded with the orchestra, and has performed on one domestic and two international concert tours under the direction of Michael Tilson Thomas. In the Bay Area, Roman also performs regularly with Symphony Silicon Valley, Opera San Jose, California Symphony, West Bay Opera, Santa Cruz County Symphony, and Monterey Symphony Orchestra, among others. Roman has presented recitals throughout North America and Europe, and has participated in the White Nights Festival of St. Petersburg (Russia), the AIMS in Graz Festival, Sarasota Music Festival, and the Idyllwild Festival. During the summer of 2005, Roman was a Fellowship recipient to the International Orchestra Institute of Attergau in Austria, performing with members of the Vienna Philharmonic under the direction of Ricardo Muti at the Salzburg Festival. He has also performed as guest principal clarinetist of Verbier Festival Chamber Orchestra during the 2008 Summer Tour, and is the winner of the Lillian Fuchs Chamber Music Competition in New York City. A dedicated educator, Roman is on Faculty at CSU Stanislaus, the San Francisco Conservatory of Music Preparatory Division, as well as the Summer Music West Chamber Music Program, and is a frequent guest coach for the San Francisco Symphony Youth Orchestra. Previously he has also served as collegiate faculty at Augusta State University and visiting faculty at San Jose State University. 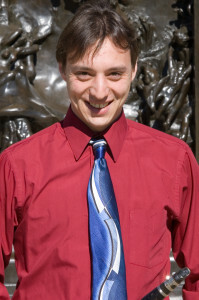 Roman received his BM at the San Francisco Conservatory of Music, with David Neuman and Luis Baez; MM at the University of Southern California’s Thornton School of Music with Yehuda Gilad; Professional Studies Diploma in Orchestral Performance from the Manhattan School of Music with Mark Nuccio; and cites Gregory B. Shapiro as an inﬂuential teacher. Additionally, Roman has performed in Master Classes for the Juilliard String Quartet, Fred Ormand, Mitchell Lurie, Daniel Gilbert, Burt Hara, Wenzel Fuchs, and Fabrizio Meloni.